Gift giving in Japan involves complex and elaborate rules and is part of a more extensive system of social exchange. Gifts are given each time another person is visited and usually exchanged on other particular occasions. Not a week goes by without an average Japanese family either giving or receiving a gift, and sometimes a not insignificant part of a family’s budget is spent on purchasing gifts. Unless gifts are explicitly given to an individual at work, school, university, etc., they are presented to the family as a unit. Nowadays, it has become more common to exchange gifts within the family, too. Otoshidama (お年玉, lit. “gem of the year”) used to be exchanged among families in the form of food and sundries. In the old days, offerings received by Shintō shrines and Buddhist temples were handed out to their parishioners as otoshidama. Nowadays, otoshidama are given to children in the form of money by parents, grandparents, other close relatives, or by neighbours, which is one reason children look forward to the New Year holidays, as they can expect a large number of cash gifts. Therefore, the habit of giving otoshidama is slightly different from other traditional types of Japanese gifts, as they are given to specific individuals, and usually from a person of superior social status to an inferior. The custom of giving gifts at midsummer, in particular at the time of the Buddhist Bon (盆) festival, as well as the gifts themselves, are called o-chūgen (御中元). Traditionally, offerings to the souls of deceased family members made during o-bon (the seventh month of the lunar calendar) were distributed to relatives and others. This habit, which is now carried out in July (except for those areas of Japan where o-bon is observed in August), has lost its religious significance. Gifts are purchased at stores and delivered to a family, or in the context of a business, to customers. Like in the case of year-end gift-giving (see below), Valentine’s Day and Christmas, Japanese stores have turned this event into an annual gift-giving frenzy, capitalising on the Japanese passion for gifts. Chūgen consisted traditionally of noodles, staples, and clothes, while businesses distributed items such as towels and fans to their customers. Nowadays, foodstuff, especially fruits, are still very popular, but other items can be given, too. Chūgen are never given within the family but are presented to one’s social superior. 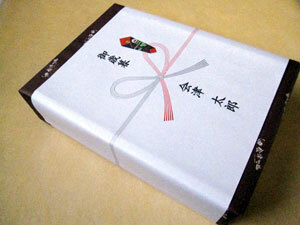 The custom of giving year-end gifts, and the gifts themselves, are called o-seibo (お歳暮) or just seibo (歳暮, lit. “year-end”) and are a token of appreciation for favours received in the past year. Those in an inferior position give year-end gifts to those in a socially superior position. 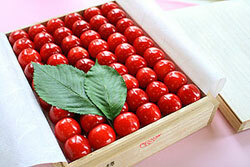 O-seibo are given from family to family, or from business to business. It is said that the higher a person’s social status, the higher the number of year-end gifts they receive. Traditionally, o-seibo were seen as the most important calendrically determined gifts and delivered personally, a custom that has been replaced by store or mail delivery. Other occasions for gift-giving are social events, such as birth, coming of age (成人, seijin), marriage, funerals, and parting (farewell gifts called senbetsu [餞別] usually consist of money or other items useful for a trip). Mimai (見舞い) are gifts to encourage ill or distressed people, while omiyage are souvenirs brought from even the shortest trips. Shūgi (祝儀) are gifts given for celebrations and on happy occasions, usually public events that mark a new stage in life or a new state of affairs and require formal or traditional clothing. Shūgi are given on occasion of births and marriages, on Shichi-go-san (七五三, the “seven-five-three” celebration), coming of age and on special birthdays, such as the 60th (kanreki), the 70th (koki), the 77th (kiju), and the 88th (beiju). Tips given to a geisha, a maid at a Japanese-style inn, and other service personnel are sometimes called shūgi too. 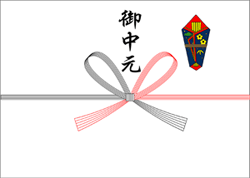 On formal occasions, gifts are wrapped in heavy white paper decorated with an ornamental string called mizuhiki (水引) and a special symbolic element called noshi (熨斗). At funerals, the tie is held in grey and white or black and white, while on happy occasions it is usually red and white. On lesser occasions, money can be placed in an envelope with the symbols printed in red (祝儀袋 shūgibukuro). Whenever money is given as a gift, the bills must be crisp and clean and enclosed in an envelope called noshibukuro (熨斗袋), which are sold at stationery stores. In Japan, gifts are more often than not given out of a sense of obligation and require an adequate return gift (返し kaeshi), with the exception of seibo, chūgen, or gifts to a teacher, a superior, or another person one is indebted to. Meishigawari (名刺代わり, lit. “in place of a business card”) are advance gifts when asking for an unusual or substantial favour of a person one has not been formally introduced to yet. Hizatsuki (膝突 or 膝著, actually maps used for worship at shrines or when kneeling during official court functions) are an advance expression of thanks, typically used at the beginning of courses in traditional arts, such as the tea ceremony. While the Japanese art of gift-giving serves the fulfilment of important social obligations by expressing gratitude and respect, it is often difficult to draw a line between mere thankfulness and ulterior motives. This, however, might be a social phenomenon not restricted to Japanese society.